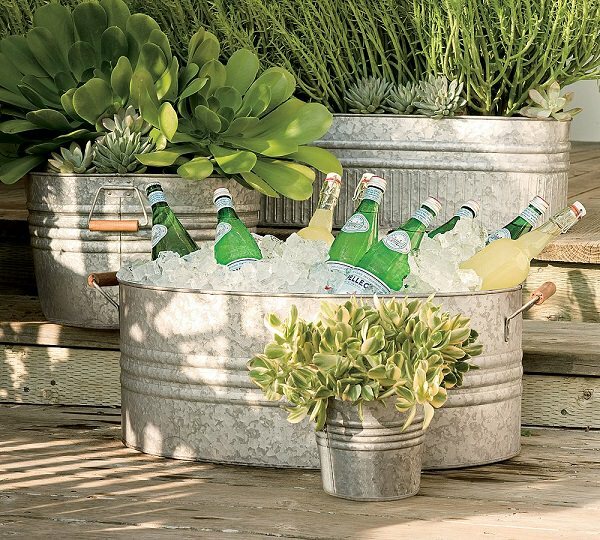 Galvanized tub fountain, water garden, ottoman or just a planter, see these 18+ creative DIY galvanized tub uses in the garden! If you are stuck with a long and narrow patio that needs to be defined and distinguished from the driveway, consider placing a series of large planters. They’ll take away the focus from the narrow space and serve to enhance the curb appeal. These spray-painted galvanized tubs are cost-effective, durable and give the feel of a knee wall without taking up space. The DIY is here! What do you get when you combine galvanized tubs and casters? 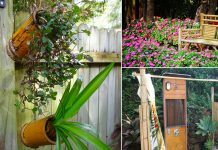 Mobile planters that give you the twofold advantage of growing various plants in raised garden beds, as well as shifting them around, to maintain ideal weather conditions. 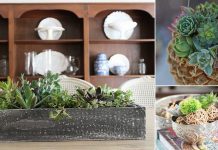 See the DIY of this latest container gardening trend here! 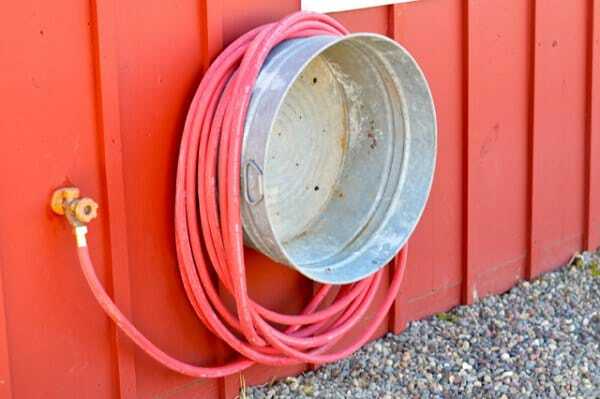 This clever storage feature is a must for every forgetful gardener or anyone who is guilty of tripping over the garden hose lying carelessly in a spot. You can also store a garden rope the same way. Click here to see the tutorial! These display bins are perfect for showcasing anything, right from your spring harvest to clay teapots. 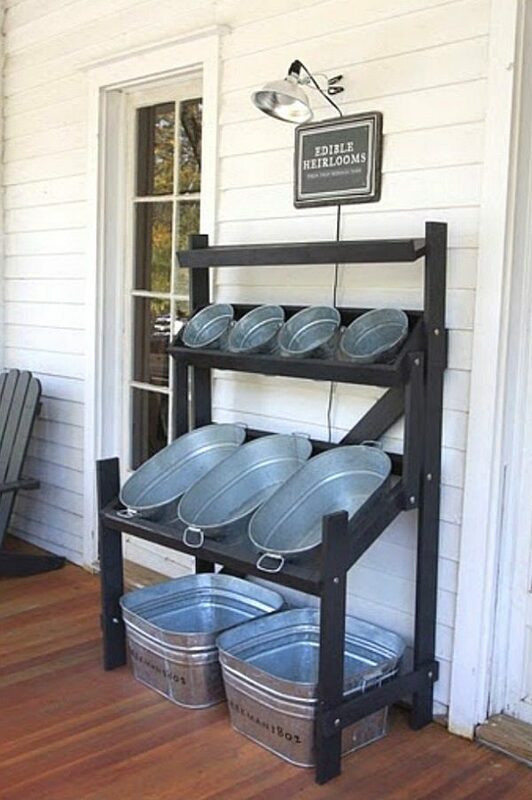 They are also a great way for storing gardening essentials in a quick grab-and-go manner. 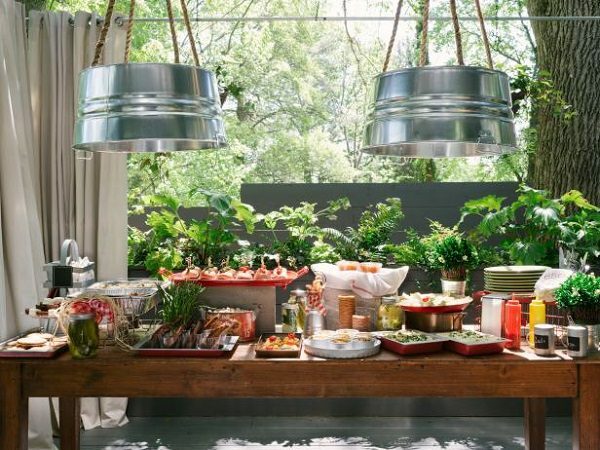 Few things are more creative than this series of uniformly-sized light fixtures recreated from galvanized tubs. The minimalistic metal sheen makes a beautiful contrast with the lights, thereby creating a dreamy atmosphere for a fun evening under the stars. Visit the DIY Network to get this project! Galvanized tubs become good containers for growing alpine plants. 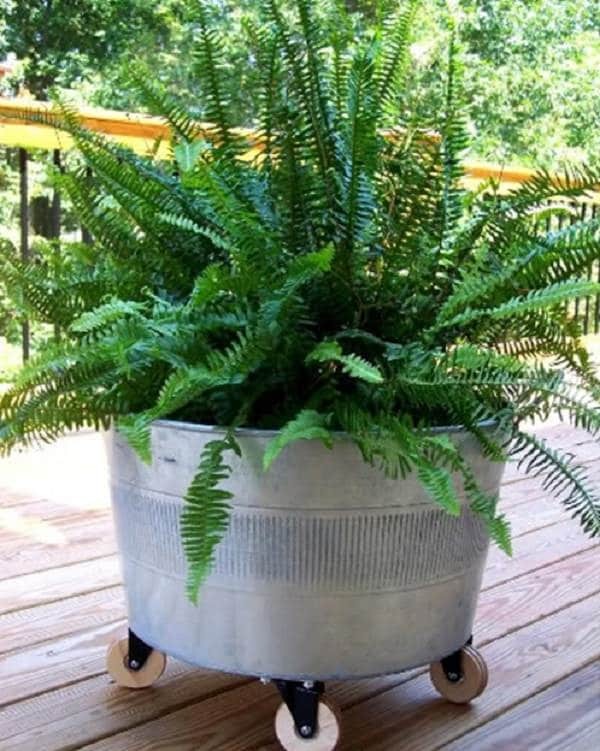 If you think the container is too big and getting heavy, consider filling with some empty jugs before adding the soil. 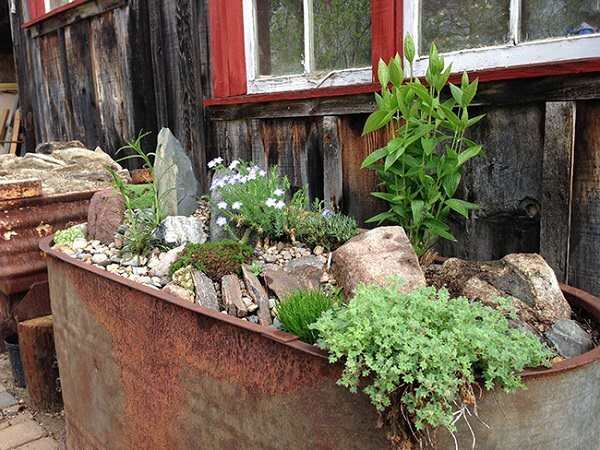 Learn to make this Alpine Trough Garden here! 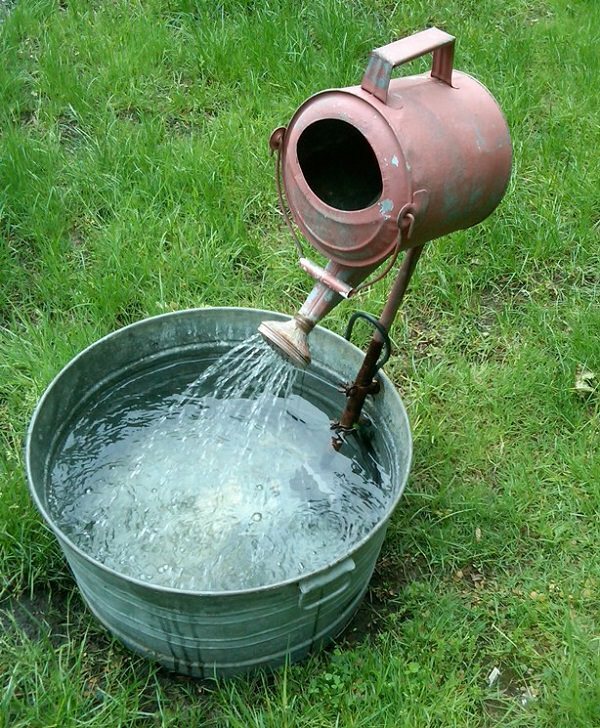 Make your garden more inviting with this charming outdoor fountain created from reclaimed objects like a watering can, galvanized tub and pump. The gushing sound of the water will drown out your woes and offer a calm atmosphere to rewind in the lap of Mother Nature. You can also do this project for your balcony. Learn more here! 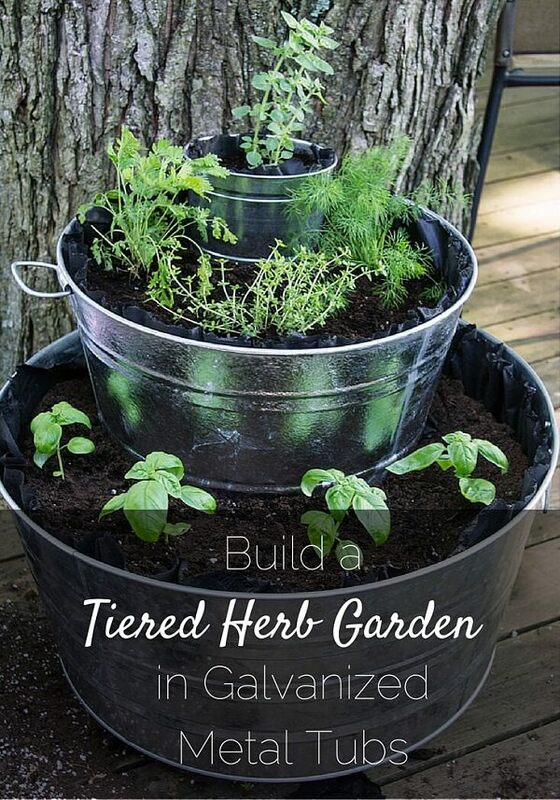 Grow your favorite herbs in this tiered herb garden made from galvanized tubs. Good for limited spaces, one more benefit is you can move it around to test different sun spots to grow a productive herb garden. Here’s the tutorial! 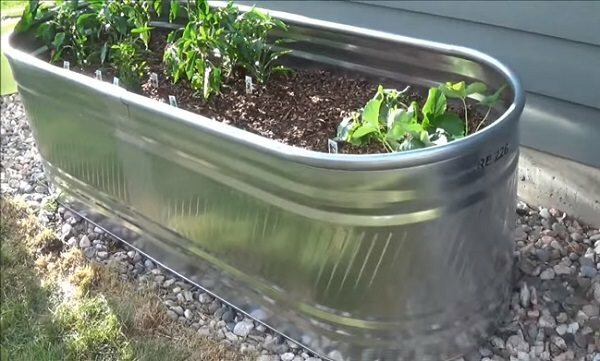 Galvanized troughs can be used as raised beds, bringing the soil to the waist level for easier maintenance. Plus, they look good and a way more durable and long lasting than wooden ones. Here’s more of it! 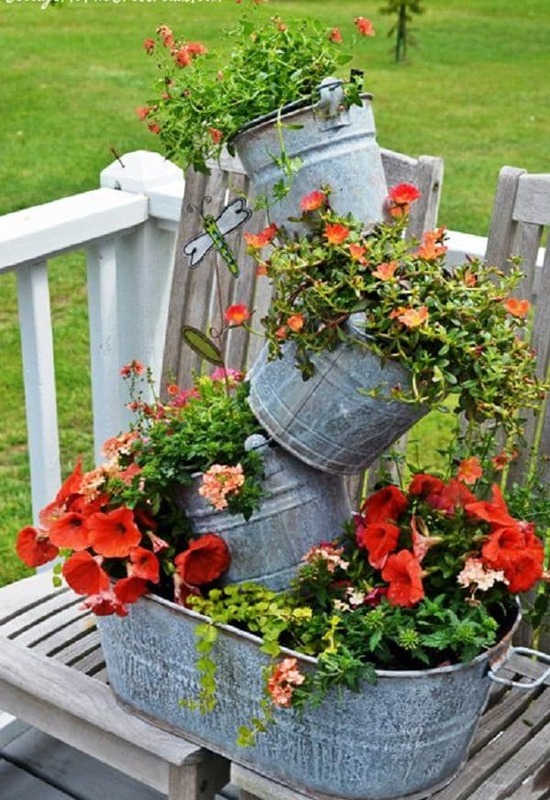 Take a cue from this DIY to make your tipsy flower tower using a galvanized tub and a series of smaller pails. It’s a great way to showcase colorful blooms and other ornamental plants. Learn more here! 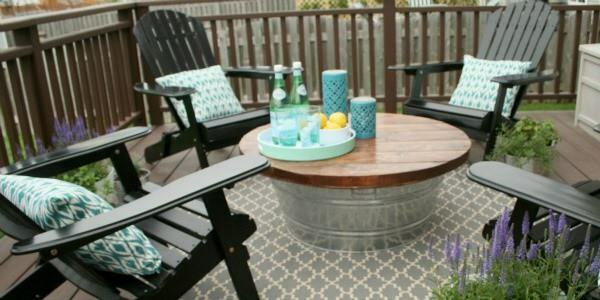 Turn a galvanized tub upside down or simply fill it up with some handpicked yard finds such as redwood branches and birch logs, then top it with a layer of glass for a fascinating outdoor table that is sure to set the pace for an interesting evening chat. Take the DIY a step further by painting the tub to accentuate the surroundings, if you please. 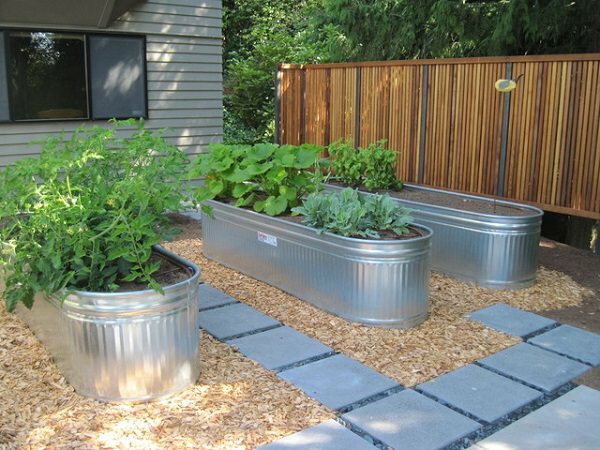 Galvanized tubs are perfect containers for creating raised garden beds. They are inexpensive, durable, last long and enclose enough space to accommodate several cuttings together. Just keep in mind that they work best in dappled shade, as the metal tends to heat up, thereby heating up the soil and causing the plants to wilt and wither. Experts recommend lining the insides of the tub with plastic, to avoid leaching of zinc or cadmium into the potting soil. Learn more here! Growing bamboo is a challenge as it sends the runners and become invasive on the ground. But planting them in large containers can prevent them from spreading and taking over your yard. 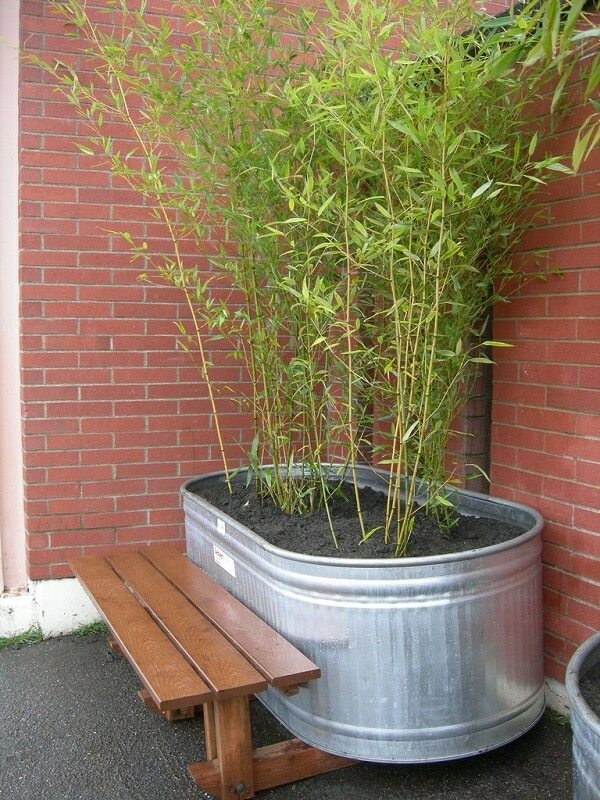 You can also place these bamboo containers on your front porch or balcony for privacy. When it comes to pampering yourself, you shouldn’t leave any stone unturned! 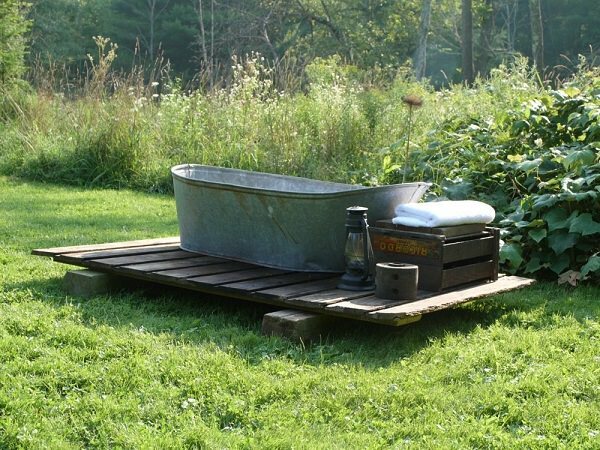 This DIY shows you how to create a mini outdoor bath from galvanized tubs. It’s an inexpensive venture that rewards you with a luxurious feeling at a minimal cost. Visit the Apartment Therapy to learn more about this DIY project! 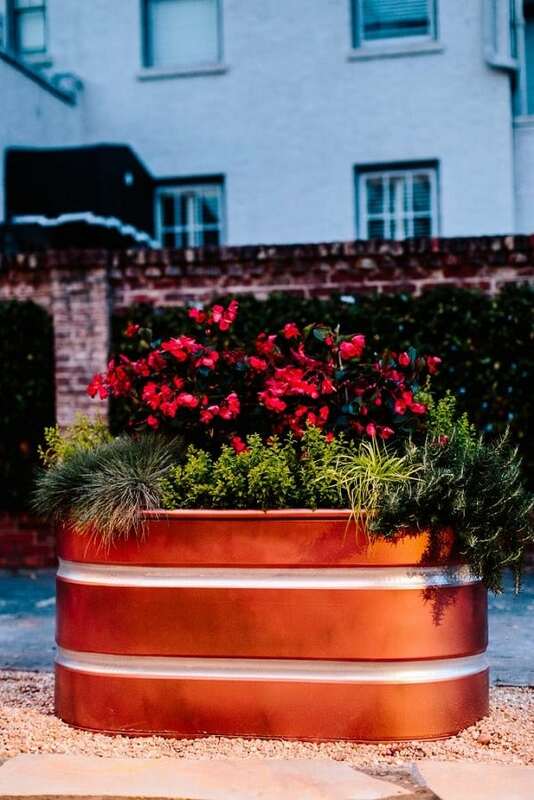 We know how galvanized planters are perfect for growing pesky, invasive plants like mint or bamboos. Another reason why they are preferred is for growing tall rush plants and grasses that can act as a sort of privacy screen. 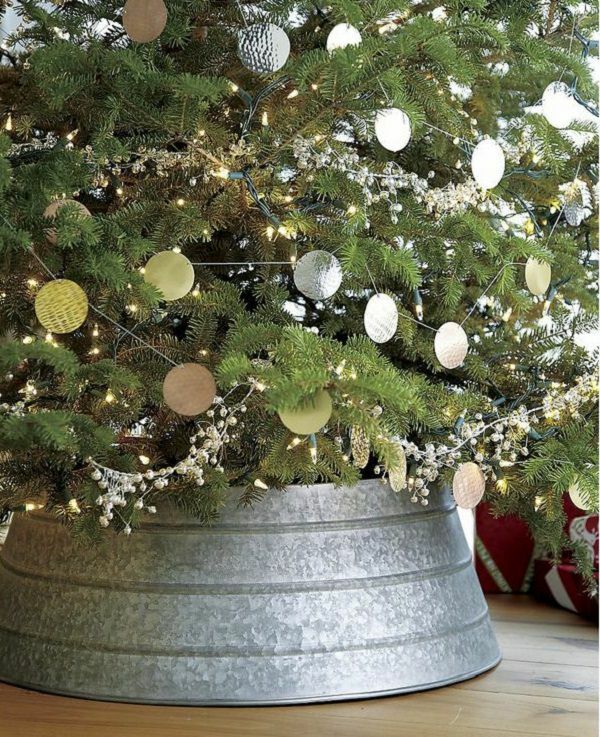 This rustic tree skirt repurposed from a galvanized tub gives stability to a gigantic outdoor Christmas tree and blends beautifully with the outdoor panorama. 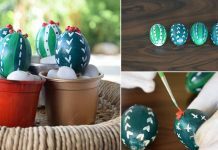 Also, it comes with endless options for customization- you can spray paint in metallic shades, or decorate with a string of fairy lights to create a nice mood for a barbecue party. 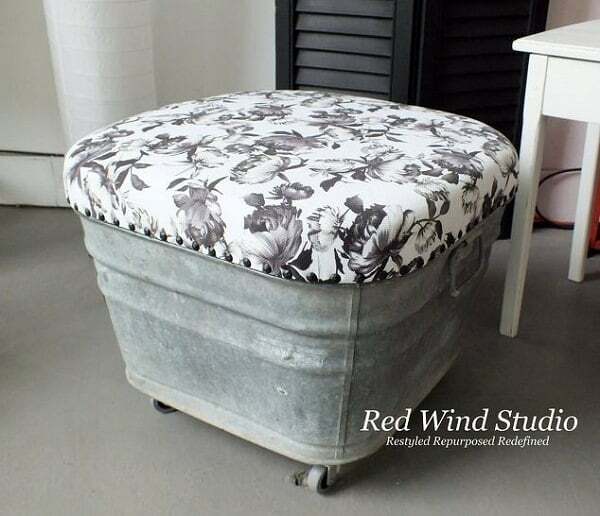 Make cute little ottomans from worn-out galvanized tubs you are not likely to use ever. Try them as outdoor seating. You can also stuff them up with toys, blankets, and anything that needs to be stored for quick access. Click here to see the DIY tutorial! 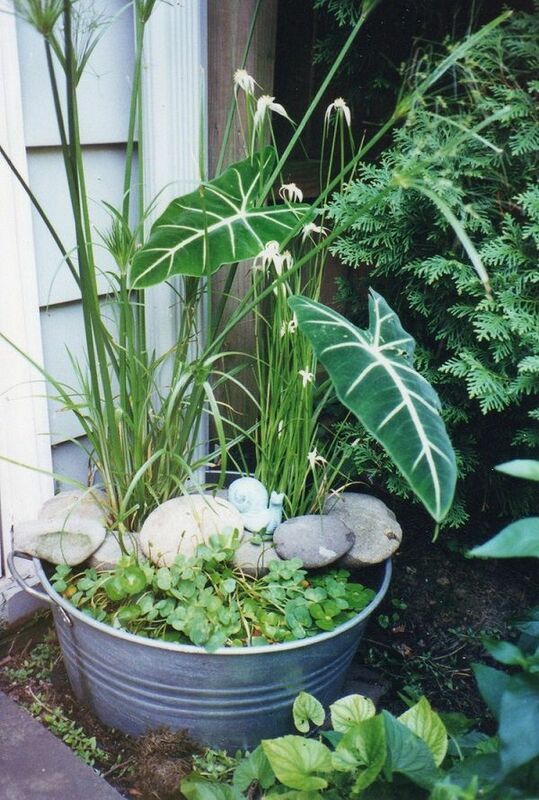 It’s remarkably easy to create a water garden in a galvanized tub. Just fill it up with water, test the pH, establish the potted water plants, anchor them with rocks or pebbles, and add a floating water plant. Learn more here!